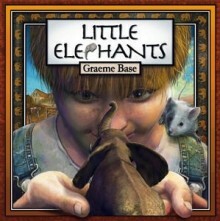 Little Elephants was written and illustrated by Graeme Base, and published by Penguin Books Australia- Viking imprint (2012). The wheat is ripe, but the harvester is broken and a plague of locusts is on the way. It looks as if Jim and his mother may lose the farm. But when Jim show kindness to a stranger, their fortunes are set to change in the most surprising way imaginable! From the creator of the bestselling favourites Animalia, The Legend of The Golden Snail and The Jewel Fish of Karnak comes this inspiring and magical tale. Little Elephants is a fantasy. We recognize magical elements like a brave young hero, kindness to a stranger, a strange-looking horn to be blown, a companion mouse …and then, little elephants! Base's twist results in his and our imaginations running wild as the petite pachyderms roar around in toy cars and turn the clotheslines into a tightrope. Yet the fantasy begins in a world rural kids will find familiar - a world where farmers struggle to make a living in the face of disasters. The illustrations are large, detailed, imaginative. I can see older primary kids relishing them as they pore over and discuss each fantastical spread together, particularly the battle scene between the little elephants and the locusts. Because of the subject matter, I believe this children's picture book may not be the best choice for young children. However, it makes a perfect choice for teachers looking for a resource to enhance a unit on natural disasters. We really love picture books that appeal to older children, this one is perfect for us. We have Farming as our topic later this year :) If you could recommend any more picture books for older children, or perhaps do a post, we'd be really interested! One I'd recommend is The Wolves in the Walls by Neil Gaiman. Really dark and scary. Older kids really enjoy it! I'll keep in mind about your post idea, which I like, and seek out picture books for older readers.